STOTT PILATES® is a contemporary approach to the original exercise method pioneered by the late Joseph Pilates. Lindsay and Moira Merrithew, along with a team of physical therapists, sports medicine and fitness professionals, have spent over two decades refining the acclaimed STOTT PILATES® method of exercise and line of equipment. The refined method resulted in the inclusion of modern principles of exercise science and rehabilitation – making it one of the safest and most effective methods available. STOTT PILATES® is recognized as The Professional’s Choice™ by studios, fitness facilities, fitness professionals and the consumer market worldwide. This is a matwork based group therapeutic class, which focuses on taking the participants out of pain and prevents further injuries. Ideal for adults of any age. 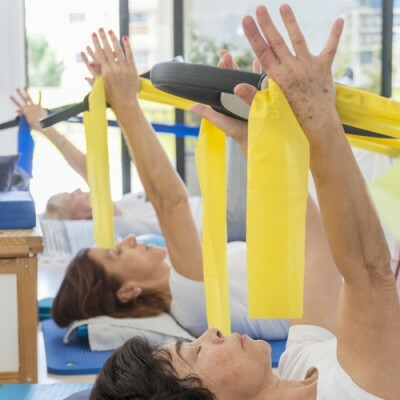 STOTT PILATES® for rehabilitation works for many reasons. The great attention to detail and form is a perfect way for a client to gain strength in the weaker or injured muscles and joints. STOTT PILATES® is ideal for prenatal women because it emphasizes in core stability, and also joint stability, reducing stress and strengthening the entire body from the inside out. This matwork based full body workout emphasizes in sculpting the body with exercises specially designed to help participants tone and firm their muscles. A full body matwork based workout which emphasizes in muscle strengthening with exercises designed to help participants enhance the flow of body mobility. High-energy and dynamic, Total Barre® integrates elements of Pilates, dance, cardio & strength training, and is fully expandable and adaptable to any client base.